Henry Cavill took to the sky Friday night in Chicago while wearing his Superman costume … giving fanboys across the country an average sized lump of kryptonite in their pants. Cavill was in the Windy City filming “Batman v Superman: Dawn of Justice” alongside Amy Adams — aka Lois Lane — and in between takes Supes was caught flashing his pearly whites. Ben Affleck was not on set — he was in L.A. for an event — but y'know it's only a matter of time until we see both of them on screen … battling cod pieces. OMG!! That man is simply gorgeous. 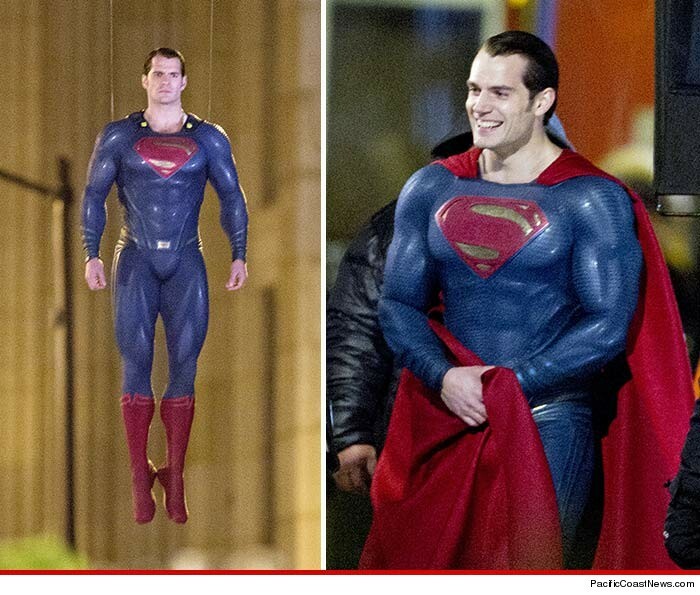 Is it just me or has he gotten “bigger” since Man Of Steel?? I’m sure it’s all special effects ladies, lets not get too excited. Can we stop talking about this guys package and get on point here. They are finally making a movie of epic proportion combining two of the greatest super heroes of all time…and one of them is being played by ben Affleck. I am not a hater, in fact I think Affleck is very talented, but after the disaster that was Daredevil should we really be giving him another shot at a super hero role? Am I wrong? who cares about affleck, all I care about is that hunk a hunka buring love in that tight suit!!!!!!!!!!!!!!!! Mr. Sanchez, as all the ladies on this form get it together, I would like to address what you said. Yes, I tend to agree that Ben Affleck did not do the part of Daredevil any justice. But keep in mind that was over a decade ago. I’d like to think he has grone and evolved as an actor, and I’m willing to give him a chance. His recent body of work has been nothing short of exceptional. Ben can play Batman, case closed. I love how people say “should we give him a achance”? Unless you’ve just recently become the head of a major Hollywood studio I’m quite certain you don’t really have a say. THe powers that be, those who give us hours of entertainment seem to belive he can pull it off, let’s just wait and see. Wait and see? Nothing to wait for, affleck will ruin this movie, plain and simple. Leave the man alone. As far as I’m concerned no one really did Batman justice since Michael Keaton, that includes Bale all you fanboys!!!!! Michael Keaton was great, don’t get me wrong. But the only reason some Batman fans name him as there favorite is because in there minds he was the original (less Adam West, which is a completely different genre in its own right). Had Bale been first, no question he’d be everyone’s favorite. Blah blah blah. Read a book. Preferably something without spandex. Ben Affleck is going to surprise the he** out of everyone! !